1) It produces the most healthful vegetables in the world. 2) It's truly sustainable (forever). There are pesticide-industry funded studies that appear to “show” no benefits of organic gardening over chemically-grown, but it’s a fact that nitrate fertilizers kill earthworms, seriously damage natural soil ecology, show up as cell-damaging nitrates in food, and are terribly resource-intensive to manufacture. Do a taste test for yourself: next August, bite into a commercially-grown non-organic tomato from the store, and then bite into one you grew in your own organic vegetable garden. Your body will know the difference! In China, people have been growing food organically in the same raised beds for 4,000 years, and in Europe, for 2,000 (See Farmers of Forty Centuries by FH King). The land there is as fertile today as it was then, because all manures and crop wastes have been carefully composted and given back to the land, continuously. Chemical fertilizers and pesticides are very oil-intensive to produce and must be trucked to their destination, practices which are unsustainable. (And just think: if you were to apply chemical fertilizers and pesticides to the same piece of land for 4,000 years, the land would be sterile and dead forevermore. We are beginning to understand this better now, and many farmers are re-learning sustainable, organic ways of growing food. 3) It's inexpensive and self-regenerating (if you compost). Once you have initially balanced your soil, homegrown produce is cheaper than storebought, especially if you save your own seed. 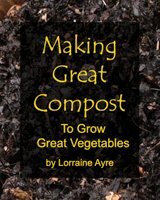 Compost is free to make, and after your first few years (when you may need to remineralize your soil with organic fertilizers), you will rarely need to add anything else. 4) Soil health is maintained and improved. Chemically-managed agricultural soils contain a fraction of these numbers. Why is this important? Each of those species has a part to play in the natural cycling of nutrients and minerals from unusable forms into life-usable forms, and back again. When these organisms are destroyed through the use of chemical fertilizers and inattention to compost, the plants become dependent on the addition of artificial fertilizers, because the natural system no longer works. It's kind of like trying to survive on vitamin pills. 5) It does not pollute the environment. Pollution from chemical fertilizer and pesticide manufacturing, as well as from field runoff, is now creating serious problems all over the world. Growing produce organically does not contribute to this pollution. 6) Organic vegetables are free of poisons. 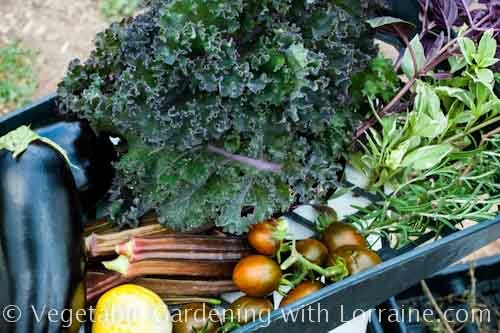 One of the best benefits of organic gardening is that organically-grown food has no cancer-causing pesticide residues or unnatural genetic patterns. Pesticides do not completely wash off produce. Every woman in the US still has traces of DDT in her breasts, even though it was banned here in 1972. But many other pesticides have been developed to take its place, including the new “systemic” ones. Systemic pesticides are applied to the soil and are taken up by plant roots to become part of the plant itself, in sufficient dosage to kill the insects that chew on the plant. The same poisonous plant that we then eat. Studies are now pointing to this as cause of the honeybee die off. Organically-grown food not only avoids all these problems, but is much tastier and more nutritious. 7) It's local, in every way possible. In every sense of the word, homegrown organic produce is as “local” as you can get. Properly-made homegrown compost is local too, and keeps the cycle of life close to home and sustainable indefinitely. 8) It enlivens our connection to the earth. This might sound kind of woo-woo to some, but we are biological beings living in a biological ecosystem, whether we understand it or not. When we become conscious of where we fit in, and begin choosing to participate in a symbiotic way with the soil and plants, something very earthy, primal, fulfilling and healing starts to happen. Try it and have the experience - it’s one of those things that doesn’t go into words very well. And being out in the garden builds strength and health, without going to the gym! 9) We can be assured we are not eating GMOs. Genetically modified organisms are not just hybridized varieties of plants that have been bred to have certain characteristics. They are organisms that have had the most fundamental blueprint of life - DNA - mixed up between species that could never combine in nature. Bacterial DNA is implanted into corn, fish DNA is implanted into tomatoes, spider DNA is implanted into goats, etc. This is done, for example, to make corn toxic to insects, or soybeans resistant to herbicides, or goat's milk full of spider silk. Our bodies are not adapted to ingest these mixed-up “foods”, and there have been several near-disasters with human health where serious problems were averted at the last minute before these engineered "foods" were released for mass consumption. Organic seeds cannot, by law, be GMOs. 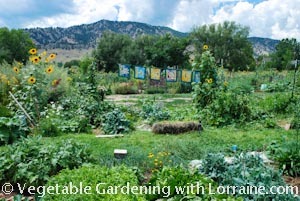 10) Organic gardening benefits the larger ecosystem. A healthy organic garden is by nature a diverse place, filled not only with vegetables, but flowers, birds, insects, amphibians, bees and butterflies. It is a safe harbor for living things, and is in balance with nature. "It is good to be alone in a garden at dawn or dark so that all its shy presences may haunt you and possess you in a reverie of suspended thought."